On the easternmost tip of Minnesota, not far from where the land meets Lake Superior and the United States meets Canada, the Brule River meets its own dividing line. As the river makes its way to the largest of the Great Lakes, it drops rapidly—800 feet in an 8-mile span. 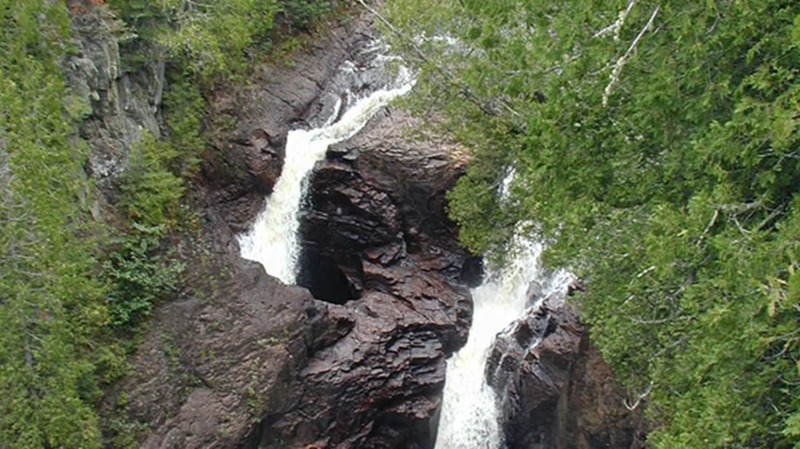 At one point in the journey, the Brule River encounters a large cluster of rhyolite rock and diverges into two rivers with two very different personalities. One is a well-behaved, 50 foot waterfall and the other? Well, the other is the reason this area is known as Devil’s Kettle Falls. The western side of the split drops into a giant hole, gulping up massive amounts of water and taking them to a place that’s yet to be discovered. The disappearing act has perplexed onlookers and scientists for years. Dyes and ping pong balls have been plunked in with the intent of tracing the path of the water, but were never seen again. While it’s assumed the pothole somehow finds an underground outlet beneath Lake Superior or reunites with its other half, so far the trail remains cold. Riverbed potholes (or kettles) aren’t uncommon, but they’re usually only surface erosions and not entire channels through which water can flow. Other explanations such as a fault line, a underground cave, or a lava tube have been largely dismissed, leaving the mystery wide open. One (highly unlikely) legend states that someone even pushed a car into the fissure in pursuit of the truth. GPS and cameras are rendered useless once they’re subterranean, and the nature of the chasm makes it impossible for humans to descend and follow the trail. Which means for now, it’s just another one of Mother Nature’s great puzzles. Since a photo doesn't really do justice to the phenomenon, here are a couple of videos so you can see the Devil's Kettle in action.